One of our favorites each year!!! 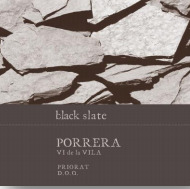 Part of the collection from different villages from Priorat, Cellar Cal Pla produced a 2014 Black Slate Porrera, which is a blend of 50% Garnacha with 40% Cariñena and the rest Cabernet Sauvignon. It is a village wine from 20- to 30-year-old vines on slate soils fermented in stainless steel and concrete vats and matured in 225- and 300-liter oak barrels (80% French oak, 20% Hungarian) for one year. The nose is beautiful, combining violets, a hint of beef blood, something ashy and an organic, soil note, developing a smoky bacon twist with time in the glass. The palate shows good integration of the oak, better than in the majority of wines from this winery. Beautiful flowers appear with time and made me go back to the glass again and again. There are 35,000 bottles produced. It was bottled in mid-June 2016.